Written by two veterans of the Apple world, "Talking to Siri: Learning the Language of Apple?s Intelligent Assistant" is a short, focused ebook that teaches readers how to use Siri from the ground up and achieve the highest recognition rates as you talk. You'll discover practical how-to mixed with examples that inspire as well as instruct. Debuting on the iPhone 4S, the voice-driven Siri assistant uses natural language processing to answer questions, respond to commands, and provide assistance. Highlands Ranch, Colorado - Have you been waiting for the first book about Apple's Siri? It's here! Published today in the Amazon Kindle Bookstore (US$4.99), Talking to Siri: Learning the Language of Apple's Intelligent Assistant details how to use the new and incredibly powerful Siri feature of the iPhone 4S. With Siri, your spoken wishes are your iPhone's command. Debuting on the iPhone 4S, the voice-operated Siri assistant uses natural language processing to answer your questions, respond to your commands, and provide assistance, as you need it. With Siri, you can set up meetings, call your mom, ask about your appointments, check your email, find your friends, and a lot more. It's incredibly convenient. You'll find yourself using your iPhone in ways you never did before because Siri makes things so much simpler. "Wake me up at 8:30 AM," "Tell my wife I'm on my way home," "Remind me to stop by the dry cleaners when I leave here": Siri offers virtual concierge services that simplify your life. This short book introduces you to Siri. You'll learn how to access the voice assistant by using the Home button, and how to achieve the highest recognition rate as you talk. You'll discover which categories Siri responds to and find out how to make the most of each of these in your conversations. You'll discover practical how-to mixed with many examples to inspire as well as instruct. Tutorials show you how to set up Siri in your preferences, and how to manage the interactive conversations you have with your voice assistant. You'll learn how to perform tasks by topic: checking the weather, doing math, or looking up information on the web. Ready to get started? Here are all the basics you'll need for talking to Siri, presented in a simple, easy-to follow handbook. 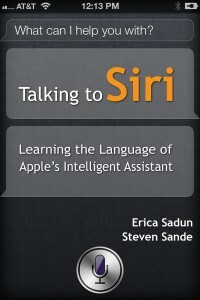 Talking to Siri was written by two veterans of the Apple world, Erica Sadun and Steve Sande. Both are writers at AOL Tech's The Unofficial Apple Weblog (TUAW). Using real-life examples and a warm sense of humor, Erica and Steve walk you through everything from finding a good Italian restaurant nearby to creating location-based reminders that text your spouse when you leave work - all by just having a pleasant conversation with your iPhone 4S. Talking to Siri is available in the US, UK, German and French Kindle Stores. At this time, the book is available in the English language only. Sand Dune Books is an electronic media publishing startup created by well-known authors and bloggers Erica Sadun and Steve Sande. Based in Colorado, the company creates and distributes highly-focused electronic media designed to educate, entertain, and enlighten. Copyright (C) 2011 TinyPlanet Software LLC. All Rights Reserved. Apple, the Apple logo, iPhone, iPod, iPad and Siri are registered trademarks of Apple Inc. in the U.S. and/or other countries.